Can our field build a workable residential model for middle-income older adults? Here is a look at some conceptual challenges to be overcome. Depending on the source, the next big demand in senior housing has long been ignored, overlooked, an opportunity, or a concern. It’s a market, according to a recent LeadingAge white paper, for which few providers have begun to prepare. The “middle market,” driven by baby boomers who are neither low- nor high-income, will redefine much of the demand in the coming decades. As a result, she adds, the number of potential residents who cannot participate in the traditional financial delivery models in which many providers are now invested will be on the rise. This means that baby boomers will—as they often have throughout their lives—demand a redesign of services. Providers will need to put their experience to work filling-in a glaring middle demand gap. The LeadingAge white paper, “Addressing the Gap in Senior Housing Today: Creating Opportunities in the Mid-Market” compiled by its Business Strategy Council, concluded that nearly half of today’s older adults are middle-income. And while the report states that older adults “experienced greater gains in economic status,” the middle-income cohort faces limited housing options. According to James Petty, senior vice president, business development at Acts Retirement-Life Communities, based on 2016 census data, the middle-market can be defined as anyone over the age of 75 with an income between $25,000 and $55,000. That amounts to almost 35% of the population over 75, or about 7 million older adults. Accommodating the middle-market requires some rethinking, from buildings to services. Acts focus groups revealed that middle consumers are not that interested in high-end services, such as luxury amenity spaces, elegant meals, and customized services, Petty notes. In short, these housing consumers want value, peace of mind, and independence. Data indicates many baby boomers will rely on inheritance in retirement, according to Petty. In a time of diminishing standard pension plans, they want housing options to help protect that nest egg. “The real cost that drives up monthly fees is labor. This group doesn’t feel the need to automatically pay for 24/7 security guards, weekly housekeeping, dining room servers, full-time fitness instructors, and activity staff,” Petty says. To that end, Petty advises that communities will need to adjust services and prices downward, rather than elevating the cost structure. Keeping construction costs and related debt lower will be essential. Older life plan communities that can’t keep up with higher end updates will need a strategy to transition to a more moderate product. “We will be looking at existing CCRCs, which could convert to serve middle-market seniors, and the construction of new CCRCs specifically designed to be efficient, yet effective for this group. We are leveraging our size to ensure a lower cost structure for the resident,” he says. Daly of BB&T echoes Petty, noting that communities are in various stages in planning for the middle market. This includes adding moderate-priced housing to their existing communities—either through new buildings, or converting existing, often older, units to rental inventory. Yet other communities have built moderate-priced options off-campus. To lower construction costs and ultimately rents, she says that project architects should have experience in moderate-priced housing. They need to bring ideas to the table to help keep construction costs down. For example, moderate-priced buildings may not include elaborate common spaces. Daly also suggests working with local government and agencies. Some actions that life plan communities can take now include starting a dialogue about middle-market housing for seniors with the city or town. Moderate-priced housing for all ages is often a priority for local townships. “Adding middle-market housing to your product offering likely goes along with your current mission, vision, and values while increasing the range of seniors you would be able to serve. It is a need with increasing demand, and it takes a team of professionals with experience in this market to bring it to fruition,” says Daly. There’s a lot of new thinking emerging about the middle market. Timothy Cassidy, principal at Bernardon, a Pennsylvania-based architecture, interior design, and landscape architecture firm, spoke of the potential of an urban/village strategy. Location and proximity can create a spectrum of no-cost support services for the middle market, ranging from dining to socialization. The key, however, is to develop policies and start the planning now, as such projects can take years to bring online. He also says that in his experience with one recent community project, middle-market baby boomers are seeking lifestyle a similar to millennials. Both groups don’t want cars, prefer nearby dining options within walking distance, don’t want to cut the grass, fix the roof, or pay property taxes. Lorraine Hiatt, an environmental gerontologist, believes a big part of the solution is to think differently about senior housing, especially late in the aging process. Hiatt cites several examples by LeadingAge members around the country working to meet middle-market demand. For example, one community has repurposed dated senior housing stock to pay-as-you-go housing in a life plan community. The residents participate in all community activities and health services, including memory care, assisted and licensed nursing care, and mobility and breathing outpatient services. Dana Wollschlager, partner with Plante Moran Living Forward, says that it could be a challenge for a life plan community to prepare for the middle-market given liabilities tied to a traditional entrance fee option. But there are strategies, including building less expensive, smaller units, offering less common-space, and building for higher density and better energy efficiency. Also, refreshing and updating older properties in competition with “shinier” construction in a mixed-income model for less cost than new construction is another approach. Such properties are often struggling and available due to an inexperienced operator, high and uncompetitive rents, poor marketing, or excessive competition. In a white paper on the middle-market, “Solving the Senior Housing Middle-Market Crises,” Wollschlager cites her mother, a retired gerontologist who predicted the wave of boomers now washing up on the senior housing market. While her parents had saved a modest nest egg for retirement, it was diminished when her mother had to quit work to care for her ill father. Once her father passed away, her mother, now 70, made the transition to a retirement community. As a widow, her mother worries about her income and financial security, according to Wollschlager. It is a daily reminder that the middle market needs solutions now. Petty says the demand of the middle market is real. He points to census projections of 15-20 million more older adults (65-plus) between 2020 and 2030, making up 20% of the total population. Ultimately, the best strategy to prepare for the middle market is the right culture. “Financial and physical protection for life—that is the peace of mind our organization is built upon—while creating community within the walls that inspire deep friendship and service to one another,” he says. 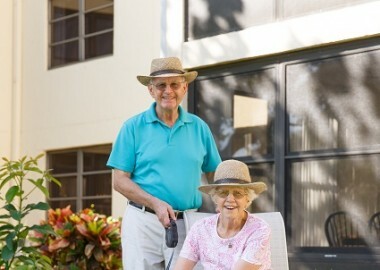 Written by John Mitchell; originally published on LeadingAge.com.